Charles II died childless in 1700. In his will, Philip of Anjou, Louis XIV´s grandson, was appointed as his successor. Therefore, Philip V´s reign marks the beginning of the House of Bourbon in Spain. European countries felt threatened with the idea of a possible union of France and Spain, so they supported the claims of Archduke Charles of Austria to the Spanish crown. The conflict arose and the War of Spanish Succession started. a) It was an international conflict between France and Spain against Britain, the German Emperor, Savoy, Portugal and the United Provinces. b) However, it also could be considered as a civil war between Castile supporting Philip of Anjou and Aragón endorsing Archduke Charles because Aragonese Cortes were against the centralist policies implemented by the Bourbons in France. Philip V was recognized king of Spain with the condition of his renouncement to French dynastic rights. Spain lost the United Provinces which were incorporated to Austria as well as possessions in the Italian Peninsula. Sicily was ceded to Savoy. Menorca and Gibraltar were for Great Britain as well as commercial advantages in America. 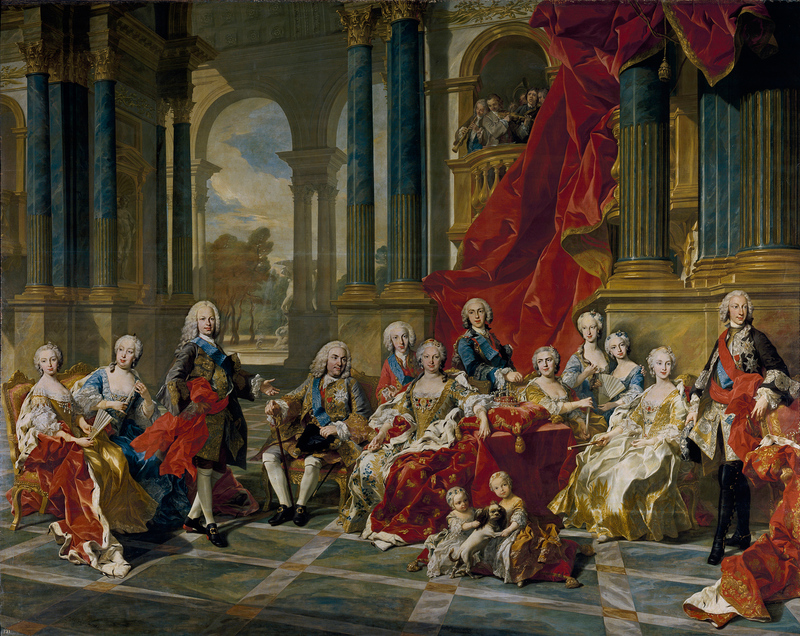 Philip V ruled as an absolute monarch. 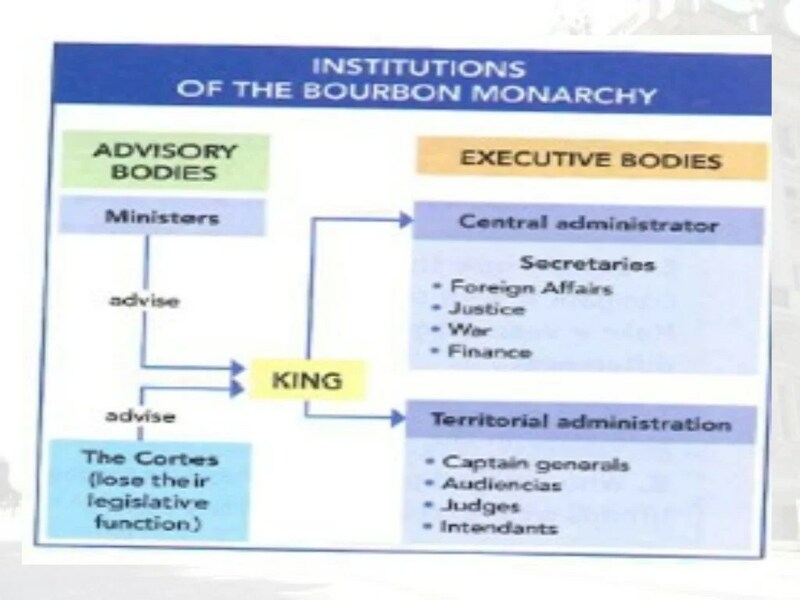 He started the Bourbonic reformation plan with the implementation of the Nueva Planta Decrees in 1707, 1715 and 1716. These decrees changed radically the administration as they introduced political centralization by eliminating the laws and institutions of Aragón, Valencia, Mallorca and Catalonia which were replaced by the Castilian. Only Navarra and Basque Country maintained their charters. On the other hand, a new provincial division was implemented to control better the territory. Philip V wanted to recover the territories lost during the War of the Spanish Succession so they signed alliances with France known as the Family Compact or Pacte de Famille. The first two were signed in 1733 and 1743. The idea was supported by queen Elisabeth Farnese who wanted territories to rule for their children as Philip´s eldest sons would inherit the Spanish crown. They conquered Naples and Sicily for Charles, later Charles III of Spain, and the Duchy of Parma for Philip which was lost again in 1737. Also, Menorca was recovered.